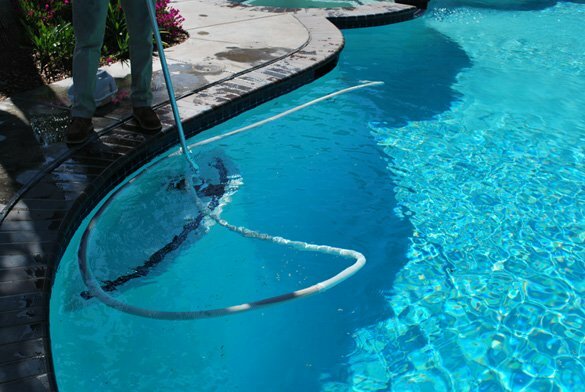 This is a Carmel Valley swimming pool service and maintenance account that we clean and maintain on a weekly basis. The San Diego pool consists of a kidney shape swimming pool with a round attached spa. Both have white plaster surfaces, blue tile and dark brown brick coping surrounded by a concrete deck. Although the pool has palm trees, bushes and flowers around half of the pool, cleaning is normal because the pool has an automatic pool vac. Regardless of whether a pool has a vacuum or not we still manually vac the pool and spa for all of our service customers each week. As part of our weekly pool service we also look at the swimming pool and spa equipment so we can notify the homeowner if any pool repairs are necessary. 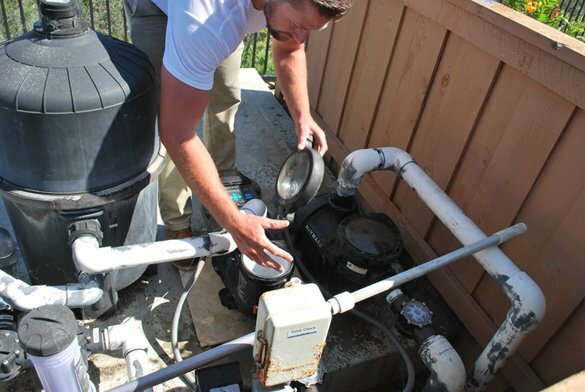 At this Carmel Valley service stop we look at the Hayward Northstar booster pump, Hayward EcoStar circulation pump, SwimClear C4030 cartridge filter and the pool heater. and balance the water chemistry along with vacuuming. Making sure that the swimming pool and spa are clean, safe and ready to be used at all times. We also clean the cartridge filter at this San Diego pool whenever it is needed. 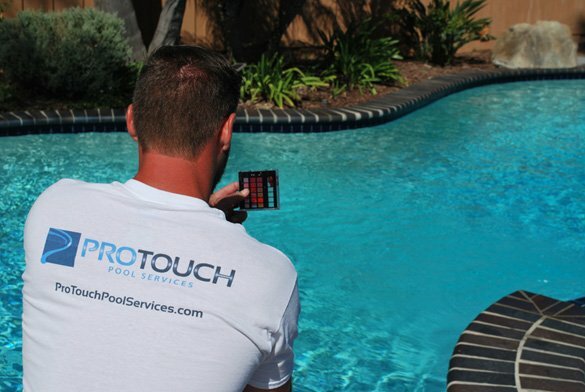 Along with our swimming pool service we offer all of our customers pool repairs, new pool equipment installations as well as pool automation upgrades. From simple drain and restarts to energy efficient pool pumps we can repair or replace any pool equipment our customers may have.